A distribution system is a system that distributes electrical power throughout a building. 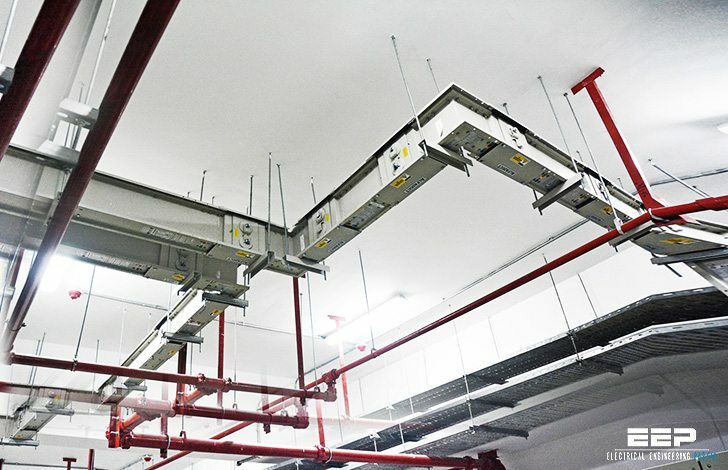 Distribution systems are used in every residential, commercial, and industrial building. Distribution systems used in commercial and industrial locations are complex. A distribution system consists of metering devices to measure power consumption, main and branch disconnects, protective devices, switching devices to start and stop power flow, conductors, and transformers. Power may be distributed through various switchboards, transformers, and panelboards. Good distribution systems don’t just happen. Careful engineering is required so that the distribution system safely and efficiently supplies adequate electric service to both present and possible future loads. A feeder is a set of conductors that originate at a main distribution center and supplies one or more secondary, or one or more branch circuit distribution centers. Three feeders are used in this example. The first feeder is used for various types of power equipment. The second feeder supplies a group of 480 VAC motors. The third feeder is used for 120 volt lighting and receptacles. Commercial and industrial distribution systems use several methods to transport electrical energy. These methods may include heavy conductors run in trays or conduit. Once installed, cable and conduit assemblies are difficult to change. Power may also be distributed using bus bars in an enclosure. This is referred to as busway. A bus bar is a conductor that serves as a common connection for two or more circuits. It is represented schematically by a straight line with a number of connections made to it. Standard bus bars in Siemens busway are made of aluminum or copper. Busway is defined by the National Electrical Manufacturers Association (NEMA) as a prefabricated electrical distribution system consisting of bus bars in a protective enclosure, including straight lengths, fittings, devices, and accessories. Busway includes bus bars, an insulating and/or support material, and a housing. Please check the download links. Link is correct. I just checked. You’re welcome! This guide is extremely usefull!